Learning how to cook vegetables can be broken down into simple, easy understandable parts. The essential parts involve cleaning and preparation and the techniques of different cooking methods. 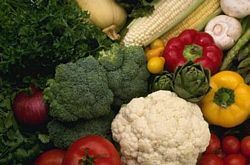 In this article we will cover these basics, as well as taking a look at what methods are the fastest and healthiest ways to cook vegetables. There are two major reasons for cleaning vegetables thoroughly before cooking them. 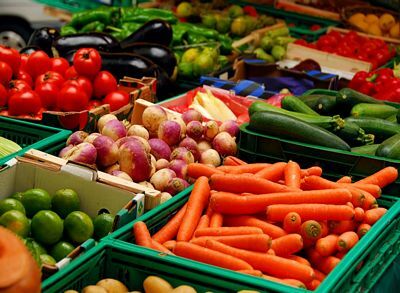 The first one, which will be obvious to anyone, is that fresh vegetables are often covered in dirt due to being grown in the ground. There’s also a less obvious reason – virtually all vegetables you buy from a supermarket will come from crops sprayed with pesticides. These chemicals, while invisible, can be harmful and should not be ingested. Make sure all vegetables are washed thoroughly before you start cooking. This is less important with vegetables that will be peeled, but it’s still good practice to do it. Peeling and chopping are the next elements of preparation. The recipe should specify how vegetables are to be prepared – whole, peeled, diced, sliced, finely chopped, mashed, and so on. There is a difference between sliced and diced – slicing means a long fine slice in one direction through the vegetable, while diced means cutting the vegetable into cubes. Boiling. This simply involves placing the vegetables in a pot of boiling water until cooked – you can usually tell with most vegetables when they are cooked because they will be soft when poked with a fork. Sauté. A sauté involves cooking all the ingredients of a meal in a pan at once, usually with oil or a little fat. Barbeque. You can cook some vegetables on a grill to go with a barbequed meal. Steaming. As the name suggests, this is cooking using steam. You boil water underneath the vegetables and the steam passes up through a grate to cook them – this method requires the right cooking utensils. Bake. Many vegetables are best baked in the oven such as baked potatoes, eggplant, squash or fresh pumpkin. Boiling and steaming, as they only use water, are known to be very healthy methods of cooking vegetables. Any method that includes using oil, such as frying, tends to be less healthy – although this depends on the type of oil used. Sautéing is next on the list of healthy options after boiling and steaming. To start learning how to cook vegetables, here are a few recipes to try. 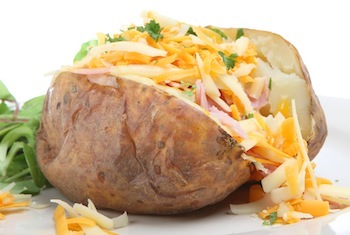 To cook whole baked potatoes, pierce potato with a fork on all sides of potato. Place on a cookie sheet or wrap in tin foil. Bake at 350 degrees for 20-40 minutes depending on size of potato. Potatoes are done when you can poke a fork in the potato easily. To cook a fresh pumpkin, cut pumpkin in quarters or small wedges. Place on a foil lined cookie sheet. Bake at 350 degrees until tender. Pumpkin is tender when you can poke a fork into the pumpkin easily. Time varies on the size of your pumpkin pieces. Scoop flesh out of pumpkin rind and puree in blender or mash with a fork. Place in plastic containers and freeze to use in future recipes. Wash eggplant well. Pierce with a fork all over eggplant skin. Place on a foil lined cookie sheet. Bake at 350 degrees for 30-45 minutes or until eggplant collapses. Allow to cool slightly. Cut open and scoop out insides. Use chopped eggplant in casseroles, add to spaghetti sauce, dips such as baba ghanoush or an eggplant recipe of your choice. Break off ends by bending and snapping the end of the stalks. Use a wide skillet the stalks can lay down in. 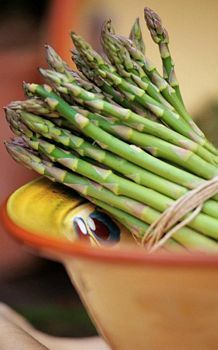 Boil asparagus in 5 cups of water with 1/2 Tablespoon salt. Boil 5-7 minutes until skewer pierces the middle easily. Don’t overcook. My favorite way to cook artichokes is in the pressure cooker. If you have a pressure cooker, add your artichokes with the stems cut off. Add 1 Cup of water and seal the lid. Once the cooker comes to pressure cook for 15 minutes. Turn off and let pressure cooker cool manually. Without a pressure cooker add artichokes to a large pot, add water to cover and cover pan with a lid. 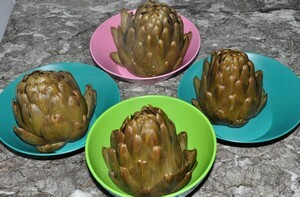 Allow to come to a boil and cook 30-45 minutes or until you can insert a knife through the middle of the artichoke. Allow to cool slightly. There are several ways to cook zucchini. You can slice zucchini into slices and saute in a pan with a dot of butter. Season with salt and pepper and minced garlic if you like and cook several minutes. You want the zucchini to still be a little firm and not mushy. Another way to cook zucchini is in the oven. Slice whole zucchini in half lengthwise. Place on a sheet of tin foil. Sprinkle zucchini with olive oil and season with salt and pepper. Add cheddar cheese, if desired. Wrap up zucchini in tin foil and bake in the oven for 20 minutes or until fork inserted into zucchini shows it is tender. 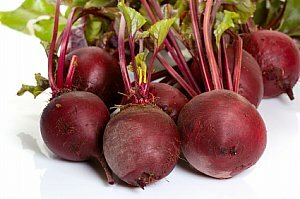 My favorite way to cook beets is roasted in the oven. Scrub outer skin of beets or peel skins if desired. Place on tin foil, drizzle with olive oil and sprinkle with salt. Wrap up and bake at 400 degrees for 20-30 minutes until beets are tender. Cut in slices or halves and serve. Try any of our food fact pages for more vegetable recipes. Do you have a tip on how to cook vegetables or recipes to share? Back to basic cooking lessons from this how to cook vegetables tutorial.